Chief Minister Harish Rawat has denied that there is any rift in the Uttarakhand Congress. Talking to mediapersons here today, Rawat said he was not aware of the decision of senior Congress leader Satpal Maharaj not to contest the elections. The BJP has stolen a march on the Congress by announcing the candidates for the five Lok Sabha seats in Uttarakhand. It has fielded three former Chief Ministers Ramesh Pokhriyal Nishank from Haridwar, BC Khanduri from Pauri Garhwal, and BS Koshiyari from Nainital. This shows that it is serious about fighting the forthcoming electoral battle on a strong footing. Vipin Negi, who works in a private firm in Mumbai, is shocked to know that the life of the people of his village is in doldrums even nine months after the natural disaster. He has come to his village in Uttarkashi district after a gap of five years to be with his family on Holi. Enthusiastic residents of Mussoorie came out in large numbers today to finish the last minute preparations to usher in the festival of colours. Sweet shops were busy as most residents rushed to buy traditional delicacies such as gujias, petha, batisa and sohan papri. Meanwhile, children thronged the markets to purchase gulal, abeer, water balloons and gifts to celebrate Holi. “I purchased organic colours and pichkari to have fun with my family,” said 10-year-old Varun. The dream of Kyarkuli residents, who had to tread on foot for two km to fetch water for the past several decades, was finally fulfilled the Peyjal Nigam started supplying water to households today after the project of laying the pipelines that began in February was completed. Rakesh Rawat, a resident of Kyakuli village, 7 km from Mussoorie, got the drinking water supply for the first time in his kitchen tap. BJP leader and former Chief Minister Bhagat Singh Koshiyari has plans for the development of Nainital as a tourist place of international level. The region has remained neglected in the past five years, he says. "I have plans for Nainital to make a name at the international level. It not only symbolises mini-India but also is the place of freedom fighters like Govind Ballabh Pant,” said Koshiyari today after he was granted the BJP ticket from the Nainital Lok Sabha seat. Scientists are studying the rapid changes in the weather conditions in the Himalayan region. According to a weather scientist, the monsoon cycle is repeating and it may show further unevenness in the coming days. A sewerage project being undertaken under the Jawaharlal Nehru Urban Renewal Mission (JNNURM) has run into rough weather due to stiff opposition from local residents to the digging of a linking road leading to Bhiladu, a small hamlet in Mussoorie. The Food Safety Department, Dehradun, carried out a drive against adulterated food items in Mussoorie yesterday. The department officials raided sweet shops in the Library Bazaar area and collected three samples from two shops. They sent the samples for testing to a laboratory at Rudarpur. A special training would be imparted to policemen who would be deployed for the Char Dham Yatra that is set to begin on May 2. According to senior police officials, around 1,500 constables, 1,000 home guard jawans and 40 sub-inspectors will undergo the special training to be organised at various places in the state. Members of the Agarwal Mahila Mahasabha organised a Holi milan function to bring people of the community together at the Radhakrishan temple here yesterday. The members presented a dance depicting the raslila of Lord Krishna enjoying Holi with Gopis. The Food Safety Department in the district has imposed a fine of Rs 82,500 on four traders of the district for violating the Food and Safety Standards Regulation Act 2011. The first inter-house lawn tennis tournament at Ecole Globale International Girls School concluded today, with Rhea Jemimah of Terra house emerging as the winner of the tournament after defeating Natalia Teig of Aer house. Security has been beefed up in and around the city to prevent any untoward incident during Holi. Flying squads have been set up to maintain a constant vigil to ensure incident-free celebration of the festival. The court of the Assistant Labour Commissioner Rishikesh Ashok Vajpayee, directed Birla Power Solutions Ltd, Lal Tappar, to pay over Rs 4 crore as compensation to the employees who had not been paid salaries for the last 11 months. It also directed the firm to pay the amount within 30 days. The AIESEC, an international not-for-profit organisation, in association with Graphic Era Educational Society organised ‘Balakalakaar 2014’ at Pacific Mall here today on its successful completion of three years. BJP workers held a rally under the 'One note,one vote' campaign and sought votes for party's prime ministerial candidate Narendra Modi at Thatyur market in Tehri district yesterday. The BJP workers led by Dhanaulti MLA Mahavir Rangad went door to door and appealed to the people to oust the scam-tainted Congress-led government by casting their votes in favour of the BJP. The party’s local unit president Narayan Singh Panwar said the BJP had received an overwhelming response to the campaign so far. It added the party would win all five Lok Sabha seats in the state. Elated BJP workers today visited former Chief Minister BC Khanduri at his house in Dehradun today and played Holi with him. The party workers were very happy at the grant of the ticket to Khanduri to fight the forthcoming Lok Sabha elections from the Pauri Garhwal seat. Khanduri happily applied colours on the faces of his supporters and extended Holi greetings to them and their families. He appealed to them to work hard to ensure the victory of the party from all five parliamentary seats in Uttarakhand. Asked about the allegations levelled by Satpal Maharaj that while the Chief Minister assured the party high command that the Congress would win Haridwar, Almora and Nainital seats and ignored the Pauri and Tehri seats, Harish Rawat said he had no idea that from where the Pauri Garhwal MP had got this information. "It is completely untrue," he said. The Chief Minister said the party high command had to take a call on fielding senior party leaders like Satpal Maharaj and Vijay Bahuguna. Asked about his preference of candidate from his Haridwar seat, Rawat said he was for a consensus candidate chosen from among dedicated Congress workers of the constituency. Fielding his son or daughter from the seat would be his last option. He added that the decision on party candidates for the five Lok Sabha seats would be known by March 22. Harish Rawat claimed that the Char Dham yatra would commence on schedule on May 4 and all possible arrangements were being made to open roads, trek routes and provide security and other facilities to the pilgrims. He said the start of the Char Dham yatra was critical for reviving the economy of the state and a positive message about preparations would encourage pilgrims to visit Uttarakhand again. He assured the people that the trek route to the Kedarnath shrine would be ready by April 20. "We are working with a task force comprising the National Institute of Mountaineering, Uttarkashi, police and the state PWD and all logistics are in place. If we get one month after clearance of snow, the work on the trek routes will be completed," he claimed. Asked about the bad condition of roads, the Chief Minister said the state PWD and the Border Roads Organisation (BRO) were working round the clock to ensure that roads were repaired in time. He said BRO engineers had identified 24 points which were landslide prone. He said all precautions were being taken for the safety and security of the pilgrims. The registration of pilgrims would be done for regulating pilgrims on the lines of the Mata Vaishno Devi yatra but there would be no restriction on pilgrims. He added that the routes to the Gangotri and Yamunotri shrines had been repaired and those of Badrinath and Kedarnath would be ready by April 20. "Efforts are on to repair the trek routes to Hemkund Sahib and Kailash Mansarovar," he said. On the other hand, there is utter confusion in the Congress about the candidates as senior party leaders have refused to fight the elections this time. Satpal Maharaj, sitting MP from Pauri Garhwal, and former Chief Minister Vijay Bahuguna have opted out of the contest. Satpal Maharaj has criticised the state government and the party leadership for allegedly ignoring his demands and his constituency during the past two years, especially post-natural disaster. On the other hand, the BJP candidates have been active in their respective constituencies for the past more than one year and have covered a lot of ground. Former Chief Minister BC Khanduri is leading the BJP campaign from Pauri Garhwal. The maximum damage to life and property was caused due the natural disaster last year in this Lok Sabha constituency comprising Rudraprayag, Chamoli, and Pauri Garhwal districts. After losing the Assembly election from the Kotdwar segment in 2012, Khanduri had set his eyes on the Lok Sabha poll. He toured the constituency more frequently after the natural disaster. He is a popular leader who had represented Pauri Garhwal in the Lok Sabha four times in the past. The failure of the state government to give an impetus to the reconstruction work in the disaster-affected areas and the presence of a large number of ex-servicemen in the constituency would go in Khanduri’s favour. 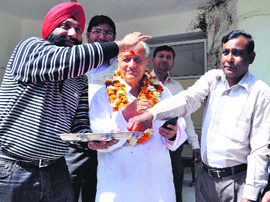 In the neighbouring Tehri Garhwal seat, Mala Raj Luxmi Shah, who defeated Saket Bahuguna in the byelection in October 2012, has again been given the ticket. She is the daughter-in-law of erstwhile king of the Tehri estate Manvendra Shah. Manvendra Shah had himself represented the seat for a record eight times in the past. Former Chief Minister Ramesh Pokhriyal Nishank has been fielded from the Haridwar Lok seat, which is represented by Chief Minister Harish Rawat. Nishank is a legislator from the Doiwala Assembly seat that is part of the Haridwar parliamentary constituency. He is no pushover. He will be a formidable candidate from Haridwar having the support of the RSS and saints. In the Kumaon region, the party sidestepped former Union minister Bacchi Singh Rawat and gave the ticket to another former Chief Minister Bhagat Singh Koshiyari from Nainital. Koshiyari, who hails from Bageshwar district, had been active in the Nainital area for the past few years. A RSS worker himself, he expects to do well with the backing of Sangh frontal organisations and the BJP legislators of the region. Ajay Tamta, BJP legislator from the Someshwar segment, has been given the ticket from the Pithoragarh-Almora (reserve) seat. He contested the 2009 Lok Sabha poll from Almora but lost to Pradeep Tamta of the Congress. However, he is hopeful of doing well this time. Former Chief Minister BC Khanduri is leading the BJP campaign from Pauri Garhwal. Satpal Maharaj, sitting Congress MP from Pauri Garhwal, and former Chief Minister Vijay Bahuguna have opted out of the contest. For him the journey back to his Gyanja village is long and filled with sadness as he walks past the main bazaar of Uttarkashi to find that the hills on the banks of the Bhagirathi are battered beyond measure due to cloudbursts, landslides and flash floods that hit the heart of the Himalayas on June 16 and 17 last year. The signs of a massive loss of human lives, property, infrastructure, biodiversity and agriculture are visible every where as villages, roads, bridges, electricity, phone connectivity and buildings are yet to be restored. This relates the tale of tardy rehabilitation works done in the past nine months, leaving the affected people stranded in trying weather conditions. A similar situation persists in the Kedarnath valley and the Badrinath valley and with the slow pace of rehabilitation and rebuilding works the affected people are running out of patience. Gyani Devi, a resident of Chamoli, says her husband had gone with a mule to Kedarnath but returned without the animal on June 17. The loss of the mule has made it difficult for us to earn our livelihood. The government despite several promises has failed to provide adequate compensation even nine months after the natural disaster. “How can we celebrate Holi in such conditions,” says Gyani Devi. The affected people of Parodi village have the same sentiments. They say that their houses were damaged due to landslides last year but politicians, who promised rehabilitation and relief, were nowhere to be seen now. The Leader of the Opposition in the state Assembly, Ajay Bhatt, says it may have been a natural disaster but the response of the government has been found wanting in providing adequate relief and rehabilitation. The inept handling of the rehabilitation and rebuilding works led to the ouster of Chief Minister Vijay Bahuguna. Harish Rawat took over as Chief Minister and is yet to do any significant work in this regard. Harish Rawat has admitted on a number of occasions that rebuilding the state is a big challenge with so little time left before the arrival of the monsoon this year. He has also stated that with ample financial support from the Central government to restart the Char Dham Yatra will be his first priority to restore the confidence of tourists and local people. However, all this talk has no meaning for Vipin Negi, who is saddened at the subdued Holi celebrations. He is contemplating to migrate to Mumbai with his family. “The politicians of the state have failed to deliver and the anger of the people can be gauzed from the fact that they are waiting to teach their representatives a lesson in the forthcoming Lok Sabha elections,” said Vipin. Many villagers instead of waiting for government help have themselves started constructing the Bailey bridge through ‘shram daan’. Several NGOS have extended their support to the villagers giving them a ray of hope who do not want to leave the abode of Gods at any cost. While kids continued to have fun, the response has been above average for shopkeepers, who were expecting business to pick-up tomorrow. Women on the other hand were seen offering prayers and preparing for the Holika Dahan, a symbolic burning of firewood, attached to the festival. In the evening, women collected pieces of wood and tied them with a sacred thread, following which they prayed around the bonfire for the well being of their families. Later in the evening, the wood was burnt, signifying the beginning of Holi celebrations. While the traders and hoteliers had something to cheer about, the added holiday rush left the traffic situation in a state of chaos. 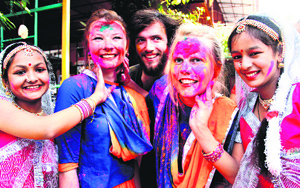 Dilip Singh, a tourist from Delhi, said as the shops would remain closed on the occasion of Holi in Delhi, they thought of enjoying the festival in Mussoorie. Another tourist, Charan Kumar from Haryana, said it was a great opportunity for him to take a break from his daily routine and enjoy the festival in peace. Municipal Council President Manmohan Singh Mall extended Holi greetings to the residents and tourists on the occasion. 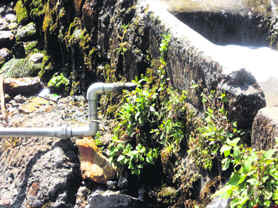 The water was drawn from nearby natural spring, a natural source of drinking water, without affecting the water supply to Mussoorie, said Assistant Block Development Officer Dinesh Joshi. He told mediapersons that the drinking water supply line project (phase one), costing Rs 4 lakh had been completed. It would cater to around 500 households of Kyarkuli village. The next phase of the project would be completed by the next financial year. With the implementation of this project, the villagers would 24-hour water supply, said Joshi. "A committee of villagers has been formed to oversee the project," said Rakesh Rawat. He commended the efforts of Dinesh Joshi towards the completion of the project in their village. Inder Singh Rawat, Anand Rawat, Anita, Sarojini and others were present on the occasion. Asked what made the BJP central leadership to neglect a senior leader like four-time MP Bacchi Singh Rawat and give him the ticket, Koshiyari said the party knew who could win from the seat. “It is the prerogative of the party to decide the candidates and no one needs to question that decision,” said Koshiyari. Koshiyari added during the last five years the hill region of Nainital had been neglected as the public representative had been catering to the problems of some persons around him. "I have an agenda in mind to take care of the hill constituencies of the area as these have been ignored despite natural disasters battering in the last five years,” he said. Koshiyari claimed that the BJP would win all five seats in the state as the Narendra Modi wave was sweeping the state. “The Congress is now rudderless as party bigwigs were unwilling to fight the Lok Sabha elections,” he said. The festival of singing and dancing with colours is celebrated with high spirits at Almora, Nainital, Haldwani, Khatima, Ramnagar, Pithoragarh, Bageshwar, Champawat and Pithoragarh towns. Holi singers from the Kali Kumaon region of Champawat district, who organise the Holi singing fete every year, involve participants from all communities in the region. “Our Holi traditions were brought to the region by the Chand kings from the Mathura region,” says Kardar Jukaria, a Holi singer from the region. According to Dr Upreti, the Kumaoni Holi, which begins from the first Sunday of the Hindu month of 'Paush', ends with ‘Charari’ or the sixth day of ‘Sukla Paksh’ on Falgun or some times in the Chaitra month. “In the three months, Kumaoni Holi sees all forms of singing, beginning from devotional songs to entertaining ones during the last phase of the festival. In some parts of the region, women take over the regime and organise sitting forms of Holi. “In Gangolihat area, Nayakgoth in Tanakpur and especially in some villages of Kali Kumaon region, women Holi singers go house-to-house to greet people on the occasion,” says Uma Pandey, a Holi singer from Pithoragaht town. “After the western disturbances and uneven heavy rain, the weather scientists worldwide have started studying the factors affecting the weather cycle so that right forecasts could be made,” said Dr Kirit Kumar, a scientist at the Himalayan Environment and Development Institute, Almora. Kumar said due to repeated western disturbances this year, the winter rain had extended, affecting the Himalayan region where the snowfall occurred more than five times this year. “The weather scientists have perceived it as the La-Nino effect, which can even result in Al-Nino and can dry the summer and extend it up to the monsoon months as well,” he said. The attention of the scientists was drawn towards the changing weather cycle after last year’s uneven monsoon and cloudbursts in the Himalayan region, which intensified after uneven snowfall in the European and American continents and prolonged winter rain this year. “We may have to face the Al-Nino effect during the summer this year. This means the summer may go dry as it tends to repeat itself in a cycle of two or three years,” added Kumar. “The other two units will be cleared for power generation by May 15 this year,” he added. VK Singh was addressing mediapersons at a convention organised to showcase the work done under the corporate social responsibility assignments. He said the 280 MW project had suffered losses of over Rs 217 crore in the last nine months as it could not generate electricity due to the damaged reservoir and the powerhouse of the project. “We had to spend Rs 150 crore for the removal of lakhs of tonnes of debris that had flowed into the powerhouse, the reservoir and the tunnel of the project due to the disaster,” he said. The project is situated at Chirkila village of Dharchula subdivision near the Nepal border. VK Singh said the project management had spent Rs 54 lakh under the corporate social responsibility assignments. The local residents said the plan of the Peyjal Nigam to lay sewage pipes and dig up the road would result in a lot of inconvenience to the commuters. Madan Bhandari, Jagdish Chandra Jain and others from Bhiladu said the digging of the road to Kempty and Mussoorie would hinder the movement of people and make it difficult to transport sick and old residents out of Bhiladu. The residents told The Tribune that they had apprised the authorities concerned of the issue a number of times but had not received any reply yet. They warned that if the road was dug without consulting them, they would not let the work begin and hold protests. XEN, Peyjal Nigam, Deepak Malik, said considering inconvenience likely to be caused to the people, the department would conduct a survey and find out an alternative route for the sewerage project at Bhiladu. The plan of the Peyjal Nigam to lay sewage pipes and dig up the road will result in a lot of inconvenience to the commuters. Food Safety Officer Rachna Lal, who led the team of officials, told mediapersons that the sweet shops were raided to check the sale of adulterated food items during the festival season. She said the samples of sweets and gujias collected from two shops had been sent for testing to the Rudarpur laboratory. Rachna directed the restaurant and sweet shop owners to maintain quality and hygiene in their products. She said more raids would be conducted in the near future to check the sale of adultrated food items. “The work of police personnel during the Char Dham Yatra is quite different, especially after the last years Kedarnath tragedy. We will train them to be polite with the people and help every pilgrim who comes for the yatra,” said DIG, Garhwal, Amit Sinha. “We want that every police personnel on duty should be courteous to everyone during the Char Dham Yatra and ensure that devotees face minimum inconvenience,” he added. The portals of the Gangotri and Yamunotri temples will open on May 2 while the portals of Kedarnath and Badrinath shrines would open on May 4 and 5, respectively. Children also presented a dance and sand songs that were appreciated by the audience. The women applied Holi colours on each others to mark the festive occasion. A skit on female infanticide was the highlight of the programme. It highlighted the importance of a girl child in society and appealed to the people to support the campaign. 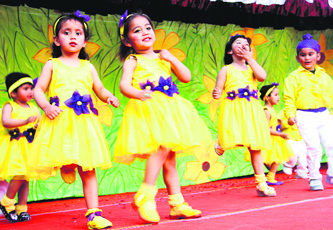 Children danced to the Bollywood tunes and enjoyed the delicacies served on the occasion. President of the Agarwal Mahila Mahasabha Renu greeted the people on Holi. The fine was imposed as the packaging and levelling on the goods were found misleading. The samples of the goods were sent to the food testing laboratory at Rudrapur last month. “The four traders, namely Tikendra Singh from Didihat, Niraj Upadhaya and Basant Kandpal from Pithoragarh town and Kundal Jimiwal from Ogla town near Didihat have been fined Rs 7,500, Rs 40,000, Rs 20,000, and Rs 15,000, respectively. The samples of goods taken from their shops have been found to be of substandard quality,” said Prashant Arya, SDM, Pithoragarh. Earlier in the first round matches, Shagun Kandari of Ignis house and Aastha Lal of Aer house won against Jiye Youn of Terra house and Aman Sethi of Aqua house. In the next level, Aditi Dixit and Mehar were declared winners. Rhea Jemimah and Natalia Teig, then played against Aditi Dixit and Mehar, and qualified for the final match. After a heated game of two sets, Rhea Jemimah won by 2-0. The tournament ended with the distribution of certificates by Amarjeet Juneja, the president of the school, and a congratulatory note by the principal. Besides regular police personnel, additional Provincial Armed Constabulary (PAC) force will be deployed across the city to ensure peace and tranquillity during the festival. Barricades would be erected on the way to Sahasthradhara and Lachiwala to check drunken driving. There will be special focus on preventing crimes against women. Night patrolling has also been intensified in the city. DIG, Garhwal, Amit Sinha, has given directions to all seven district police heads regarding security arrangements during Holi. He has directed the district police chiefs to take necessary steps to have peaceful and trouble-free Holi. A total of 126 employees of Birla Power Solutions Ltd have not been paid salaries for the last 11 months. The aggrieved employees had met the Chief Minister, following which the Sub-Divisional Magistrate conducted an on-the spot enquiry. SDM Rishikesh, who visited Birla Power Solutions Ltd, mentioned in his report that besides non-payment of salaries, there was no power or drinking water facilities in the factory. The event gave an opportunity to underprivileged children to showcase their talent on the canvas. It is to be noted that Balakalakaar is one of the initiatives of the AIESEC and has been organised in various cities across the country. Balakalakaar 2014 is the first of its kind initiative in Dehradun with an aim to spread awareness about child rights. The Graphic Era Educational Society is a partner in the initiative.